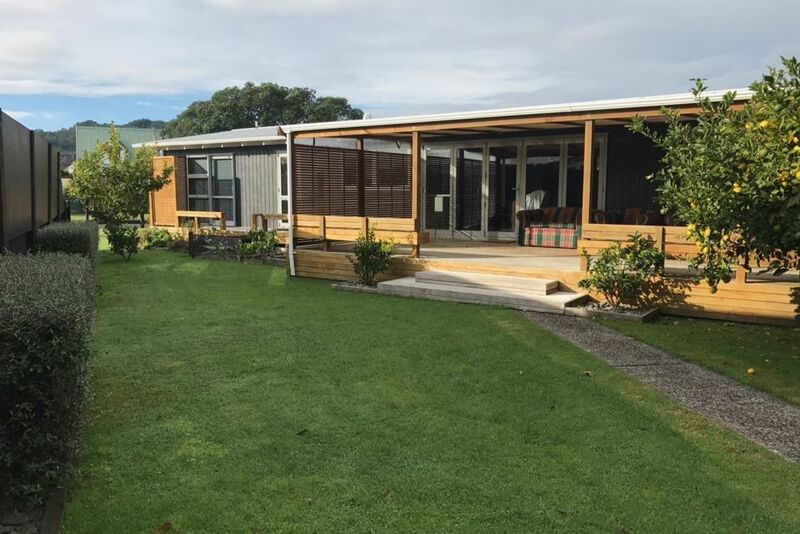 This 3 bedroomed home which had a major make over in 2013, is the ideal holiday renter for people who love the options a huge private deck can give you when in holiday mode! The living space attaches to the sun filled deck with large bifolding doors giving great indoor outdoor flow, ideal for alfresco dining etc etc. A flat easy 2km walk along the picturesque estuary takes you into town to all the shops, cafes, and restaurants as well as the ferry that can take you across to Ferry Landing. A huge park area is just 1 house away as well, making it an ideal spot for the kids to run round in. This house has a heat pump and great insulation (all windows double glazed) which keeps the house warm and cozy during the winter months. Section is not completely fenced, may not be suitable for young children. Plenty of room to park boats and cars, plus also an outdoor fish filleting bench. We thoroughly enjoyed our stay at this home! We were traveling from overseas and struggled a bit to find a place that wasn’t a traditional NZ Bach and had linens and towels included since we wouldn’t be able to bring our own. I am so glad we found this home that fit the bill. The house was wonderful and is clearly a cherished family home as well. Lots of nice touches throughout and the location was great as well. Easy access to Whitianga (and the rest of the Coromandel) but in a quiet and peaceful neighborhood. Plenty of space for our family of 5. We all wanted to stay longer! Highly recommend! Thank you so much for the use of this lovely bright, clean and peaceful home. I Highly recommend this holiday home. The house was perfect! It was lovely and homely with everything you could possibly need while on holiday. It was impeccably clean and well kept with an amazing outdoor deck that was great to relax on in the evenings. No more than 2 minutes walk away from the water made it even better. All in all we absolutely loved our stay in the lovely home and would recommend to anyone!! Very comfortable accommodation. Close to the town and activities. The Bach was very clean and had everything we could possibly need. Lovely sitting area with bbq on patio. Fantastic place to stay, very happy. Great boat tours available taking in Cathedral Cove, a must see. Highly recommend the Glass Bottom Boat Tour, great visibility through the glass bottom and snorkelling also able to be done in the warmer weather.